Services included all aspects of the project: site utilization studies, master planning, building design, interior design, ADA requirements, lighting, mechanical , and electrical. Chisolm Community Assisted Care Complex provides assisted care for people who are ambulatory but unable to provide their own total care due to age and/or medical considerations. The facility consists of individual, factory built, modular living units that are bolted together and completed with an office area, laundry, kitchen lounge, and dining area. The individual living modules come complete with a bedroom, living room, bathroom, and their own heating and cooling. The structure is of wood frame. the entire complex is on one level and includes a covered entrance, a wood deck at the back, and a gazebo. The project was built on the site of a former low income housing development and involved the use of the existing street and utility structures wherever possible. 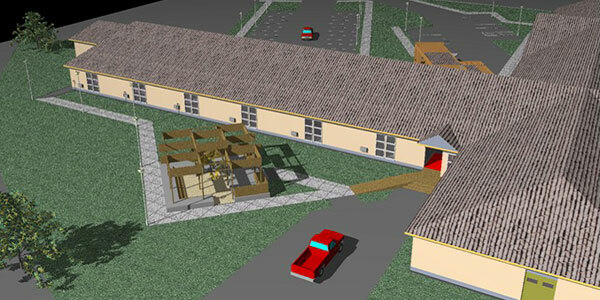 The scope of work performed by for this project included preliminary research, programming, schematic design studies, preliminary plans, preparation of construction documents, including drawings and specifications, cost estimates, construction administration, and computer generated 3D renderings.